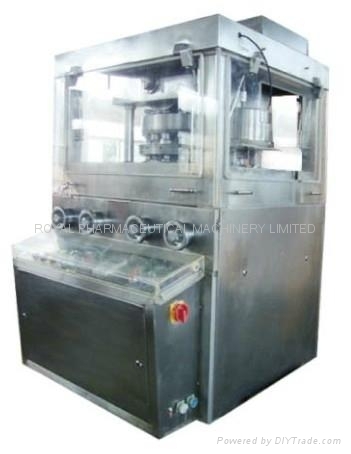 This machine is double-press and continuous automatically tablet press for pressing granular raw materials into tablet. It is mainly used in pharmaceutical, chemical, food and electronic industries. Machine meet GMP and transparent window which could help to observe the status of pressing tablet. Transparent window could be fully opened, machine easy to clean and maintenance. AII monitors and operating components work well together. A power suction unit is attached to take the residual power during operation, so that the blockage powder can be collected and be reused.